The day I had been waiting for had arrived and although I pressed the snooze button four times (remind me why rowing has to be at such an awful hour of the morning to wake up?!) I was excited to be heading to the Olympic Rowing at Eton Dorney. The area was awash with people dressed in their countries favourite colours, the red white and blue of the British flag being the most prominent but with smatterings of colour coming from flags and games workers. As you walked towards the course, and despite the early morning wake up, there was an electric energy in the air, the result of too much coffee or perhaps it was because we were about to see the best athletes in the world row for gold. ; the mystery was further added to because as you walked into the area the seating obscured the vision of the lake and boat houses. The first event I saw was the Men’s Double scull, that is two men rowing with two oars. The Kiwis, pictured below, were the reigning world champs and racing to defend their title and bring home a medal. Throughout the race the Slovenians maintained a steady lead until the 500m mark when all the crews began to push during the home stretch. I didn’t get a picture of the finish line but yes, the Kiwi’s did it and not only bought home gold but remain the world champions. Of the races of the day my sleep in meant that I was only able to see two races which featured Aussies and the mens four, that is four men with one oar each, was one of them (check out the Aussies at the top of the photo next to the South Africans.) 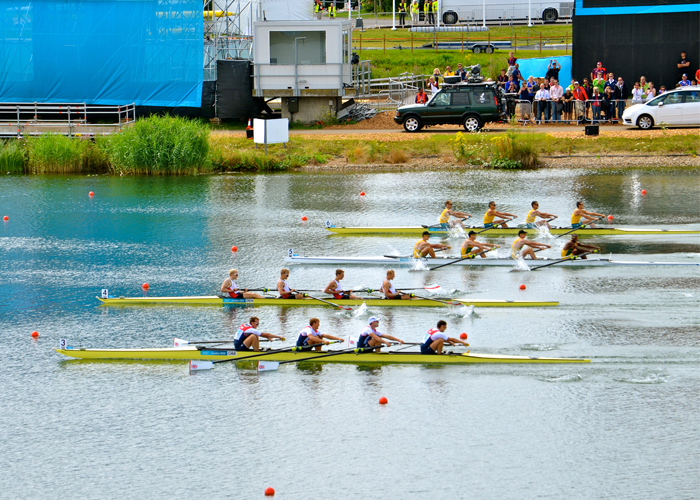 This race was a close one as the four teams surged into the final 500m each with a medal in their sites. Unfortunately for me the Aussies came in fourth behind South Africa (gold), Great Britain (silver), and Denmark (bronze). The medal ceremony would have been extra special for the bronze placing Danish team as His Royal Highness Prince Frederik, Crown Prince of Denmark presented the medals on behalf of the Olympic committee. The women’s VIII medal event was the race I was most excited to see because it was my favourite when I used to row – and the Aussie girls were racing! It didn’t take long before team USA had a clear lead over the others thought the Netherlands and Canada stayed with them the whole way. The Aussie girls weren’t far behind but as a relatively young crew they couldn’t match the pace set by the other crews. A note on celebrating athletes accomplishments and not putting them down. I would like to make one comment on the attitude the Australia media towards our athletes. For the last few weeks we have criticized our Olympians for not getting more gold medals, especially the swimmers. Sure they might have a little ego inflation pre-event (I’m looking at James Magnussen) but to criticize them when they win silver or bronze – that’s just poor sportsman ship and we’re meant to be the country with the greatest show of sportsmanship. To even reach Olympic athlete status takes years of commitment, sacrifice, and hard work – I know because I’ve seen a friend go through it. We should be celebrating the fact that they made it, that they’re there representing themselves, their sport, but most of all they’re representing their country, my country and maybe even your country. We should support them no matter what and if they win a medal – of any colour – we should be just as proud and celebrate just as hard. Eton Dorney is an hour train ride away from central London and accessible by one of two stations.